Wright is the brilliant man who brought us ‘Shaun of the Dead‘, ‘Hot Fuzz‘, ‘The World’s End‘, and ‘Scott Pilgrim vs The World‘. With those movies alone, you can only imagine what Edgar Wright could do in the Marvel Universe. However, it was never meant to be. Wright and the executives over at Marvel did not see eye to eye, so Wright left the project after working on it for three years. Marvel does a lot of good things and makes correct decisions most of the time in regards to their characters and stories on film. This is not one of those times. Instead, we got a director named Peyton Reed, who is the guy who brought us the cheerleading movie ‘Bring It On‘ amongst other flops. This is a different film for the comic book company. Marvel bet big on ‘Guardians of the Galaxy‘, which was not their routine story and set up, like we’ve seen in the past, but it ending paying off in a big way both critically and financially. 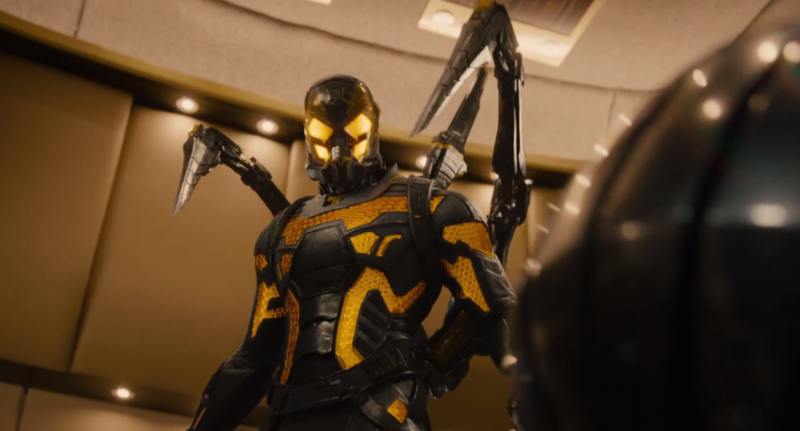 With ‘Ant-Man‘ they have a comedic actor, who really hasn’t done anything in the form of action, take on the Marvel Universe and will be a part of the ‘Avengers‘. Again, this is a big bet for Marvel if they can stray from their usual storyboards. With the exit from Edgar Wright, it didn’t look like a good bet. In an effort not to push back the release date of ‘Ant-Man‘, Marvel hired Peyton very quickly, and after viewing the film, it became evident that almost everything was rushed. That being said, ‘Ant-Man‘ is for sure a heck of a lot of fun and will sure make enough money for Marvel to bathe in and provide the already announced sequels. But that’s about it. It’s just a fun movie. Nothing more. Nothing less. 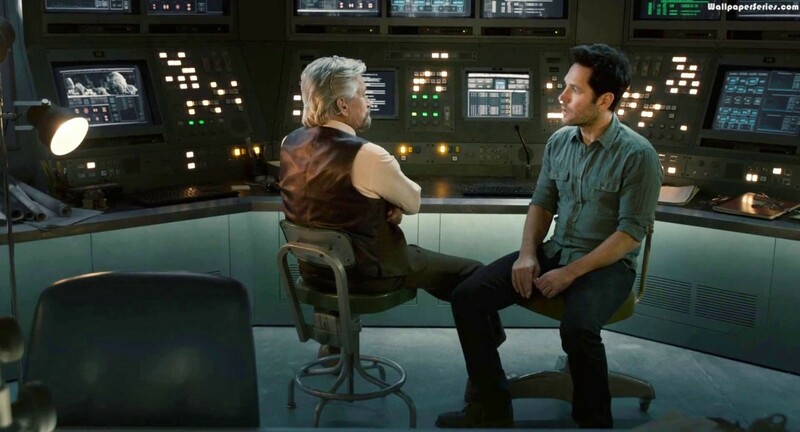 ‘Ant-Man‘ rushes from scene to scene and from montage to montage, leaving us out of any real character development from our heroes and villains. It just isn’t really there. Yes, we get the backgrounds of everyone and some resemblance of a relationship between a few people, but it’s all settled with a line of cheesy dialogue with no real emotion. As I continued to watch each scene, I could only think and say to myself, “Edgar Wright would have done such a better job here.” Unfortunately, that’s the way it is, folks. 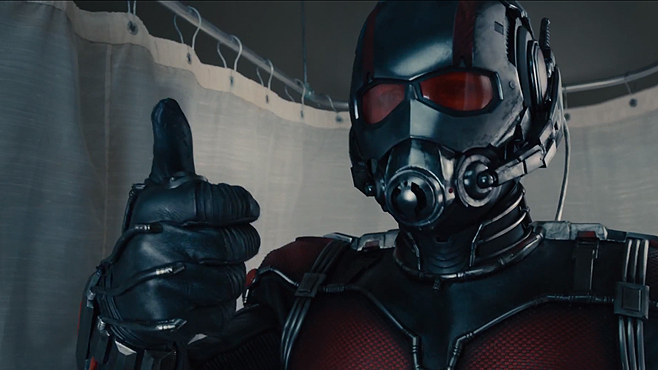 Paul Rudd is fantastic as Scott Lang/Ant-Man. I mean, how can you not like Rudd’s genuine and unique comedic timing and charm, and that’s where this movie succeeds most. Michael Douglas sure hasn’t lost a step either, playing Hank Pym. He owns the role. Corey Stoll plays the villain of the film and while he is an excellent actor, the role and dialogue for him is so over-the-top and cliche, that you can’t help but roll your eyes. Then there is Evangeline Lilly, who plays Pym’s daughter Hope Van Dyne. She does an excellent job in her role, but again, the cliches are there and comes across as more as a character we’ve seen many times before. Perhaps the best part of the film are not with any of the superhero action, but with Scott Lang’s criminal trio of friends, played by Michael Pena, David Dastmalchian, and T.I. Every time they are on film, I laughed till I hurt. They were fantastic. Unfortunately, they don’t have much screen time. There are very small moments here and there where you can see Wright’s hand prints, but they don’t come along very often. Of course, you’ll want to stay through the entire credit sequence as there are two extra scenes to get you excited for future films. That all being said, ‘Ant-Man‘ is still fun, but doesn’t hold a candle to any of the previous Marvel films we have grown to love. This entry was posted on Tuesday, July 14th, 2015 at 12:17 pm	and is filed under Comics, Film, News. You can follow any responses to this entry through the RSS 2.0 feed. You can skip to the end and leave a response. Pinging is currently not allowed. « Ryan Murphy Gives Us A Taste of ‘American Horror Story: Hotel’!!! No, Dad. It will work. No Dad, I won't put Danny on.